For the last few weeks it has not stopped raining. The roads I usually drive to work were flooded and had to be closed, I had to drive the long way around. My Landy has a leak above the door, so I needed a supply of towels to catch the flow of water. I was one of the lucky ones, as in town many homes were flooded, and people lost everything they had. The Red Cross and the Vincent De Paul have been asking for blankets, towels, sheets etc.. as well as donations. With Christmas coming closer it will be a difficult time for many. 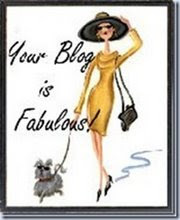 I have not been to visit many blogs recently but hopefully over the holiday season I will have more time. 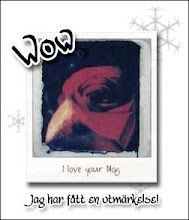 I have just updated my Christmastime Magic blog also. Sorry I have not been visiting all your wonderful blogs. I am visiting Mel and Chris in Henley at the moment, on a welcome pre-Christmas break. The Vintage Look, is a tiny little shop tucked away in the back of the Waitrose car park. There are plenty of Christmas gift ideas and wonderful vintage finds. Jugs, teapots, baskets, soapdishes, heart garlands, ribbons, lavender bags, notice boards, and tiny little mannequins for hanging jewellery on, a haven of trinkets and vintage styles. I loved shopping. Check out Karin's beautiful give away at Seasons of my Home. The Christmas preparations continue on my Christmas Time Magic blog, click here to visit. Presenting Miss Penelope Adelaide and Miss Beatrice Adelaide, otherwise known as the Lady Adelaide Twins. They will be Carol singing next weekend at Castlefarm, during our fund raising efforts for one of our favourite charities. I made them this weekend using the Tilde patterns. 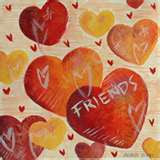 For information about the hearts featured here, visit Christmas Time Magic, my Christmas blog. I was itching to try out some of the new patterns I bought at the Knitting and Stitching show recently. I purchase two books, one is "Tilde's Juleideer" in norwegian and the other in english, is "Sew Pretty Christmas Home Style" by the same Author, Tone Finnager. I have entered Tilde's World. I am now offically an addict of this wonderful craftswoman's work. 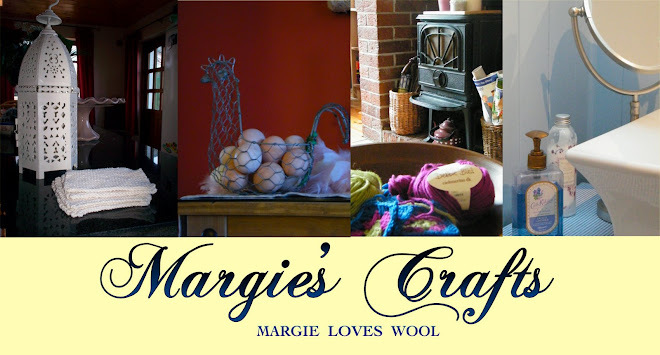 I have discovered there are lots of blogs dedicated to her work in numerous languages and many on line suppliers (I have not found any in Ireland as yet). 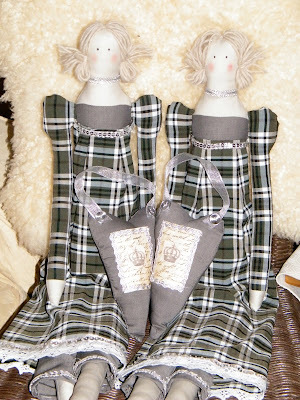 I started working on my first dolls, but as I had no Tilde fabric or Christmas fabric, I used Cath Kidston fabric and some gingham. I spent a pleasant afternoon cutting (with Leiny's help) and sewing my doll's body, arms, bendable knees and her long johns/pantaloons. I filled the parts and set about assembling them. Some hand stitching is required. Here she is complete with her wool hair and her heart on her sleeve. I have not given her a name as yet. Do you have any suggestions? Dont forget to drop by Christmas Time Magic too. I made two new cushions for the wicker chair one from some pretty blue check material, and the other from the old denim shirt leaving the pockets intact on the front. I gave the airing cupboard a clean up too and it all looks bright and welcoming again for a little while longer. You are welcome to drop by my Christmas Time Magic blog to see how my Christmas preparations are coming along. You are very welcome to my blog, I hope you enjoy the text and the photos, and that you visit often. I love to read comments from all over the world. Photos and text have my copyright. I am a community worker I was working full time until my cancer diagnosis in October 2013. I have been interested in crafts all my life. I am always knitting or sewing. I love the different seasonal crafts and spending time with family and friends. Roll out those hazy lazy crazy days…..